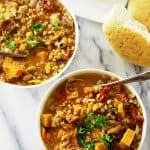 Beef stew is such a heart-warming, classic dish and most of us are very familiar with how good it tastes. 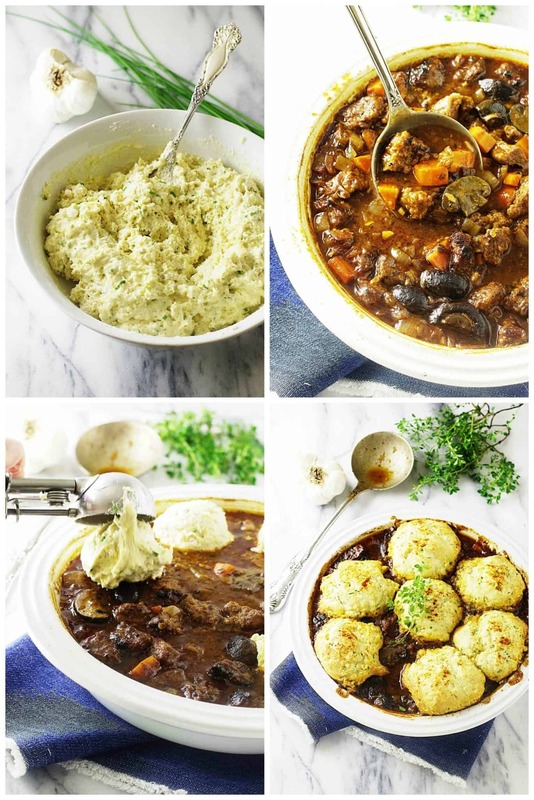 We have re-vamped our basic beef stew for this recipe of beef casserole with garlic-chive einkorn dumplings. The casserole is loaded with beef chunks, parsnips, carrots and mushrooms in a flavorful sauce. The dumplings, made with einkorn all-purpose flour, are studded with garlic and chives that are crisp and toasty on top and light and soft inside. This hearty casserole is a real beef-lovers meal. 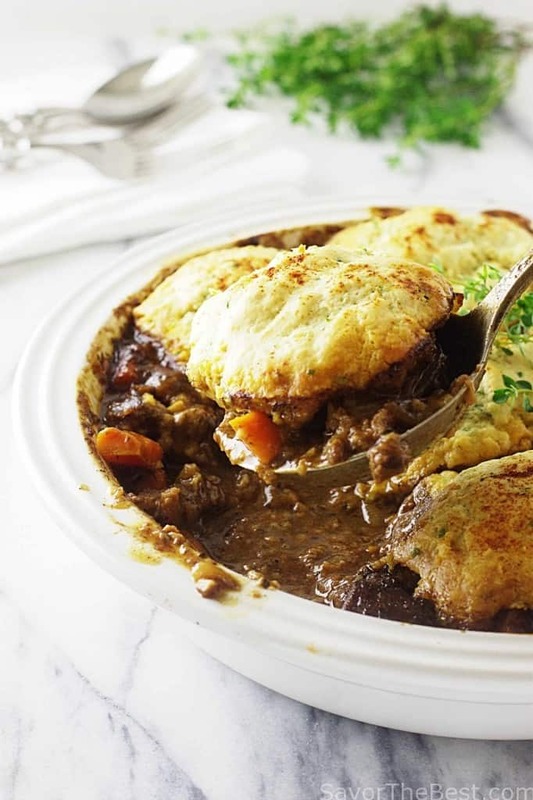 It is packed with chunks of tender beef, lots of carrots, parsnips and mushrooms. 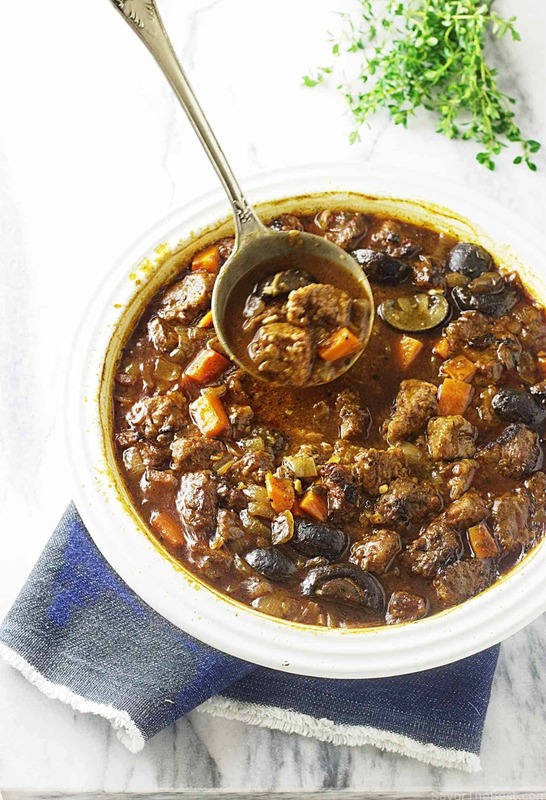 The beef and vegetables are all swimming in a rich, flavorful sauce made with beef broth, red wine, onions, garlic, fresh herbs and smokey paprika. It’s a complete meal packed in one easy to make dish. Leftovers freeze well for a fast and nutritious meal later in the month. The garlic-chive einkorn dumplings are just too good. 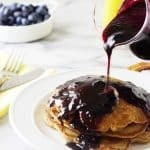 You may want to make a double batch and have some for breakfast or lunch the next day. We used all-purpose einkorn flour to make the dumplings and included big-flavor boosters of finely chopped garlic and fresh snipped chives. The Einkorn flour makes these dumplings tender, light and incredibly delicious. The einkorn flour gives the dumplings an extra special flavor and it boosts the nutrient value significantly. Einkorn has a much higher protein content than other wheat varieties and it is higher in vitamins and minerals. The starch structure in Einkorn is very compact and is digested slowly and easily. This quality prevents blood sugar and insulin levels from spiking too high and it keeps you feeling full for a much longer period of time. Click here for a research article on the nutritional values of Einkorn. Although einkorn is not recommended for anyone with Celiac disease, many people with gluten sensitivities find they can easily tolerate einkorn. Check out this article by Einkorn.com exploring the reasons that einkorn is easier to digest than modern wheat. After adding the dumpling to the top of the casserole, they were dusted with paprika and baked to a crispy-brown top. These dumplings are soft and light inside and incredibly delicious with the chopped garlic and fresh chives mixed throughout. This is an easy meal and most of the recipe can be made ahead of time. 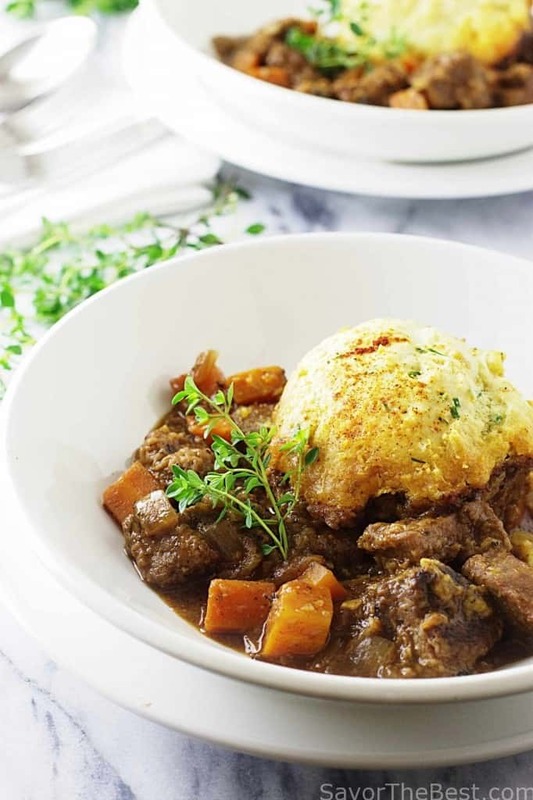 You could plan ahead and prepare this beef casserole in advance except for the dumpling, then reheat the casserole, add the dumplings, pop everything into the oven and….Voilà! Dinner is on the table! You can purchase einkorn flour and einkorn wheat berries here. 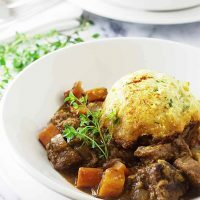 This beef casserole with garlic-chive einkorn dumplings is loaded with beef chunks, parsnips, carrots and mushrooms in a flavorful sauce. The dumplings, made with einkorn all-purpose flour, studded with garlic and chives are crisp and toasty on top and light and soft inside. 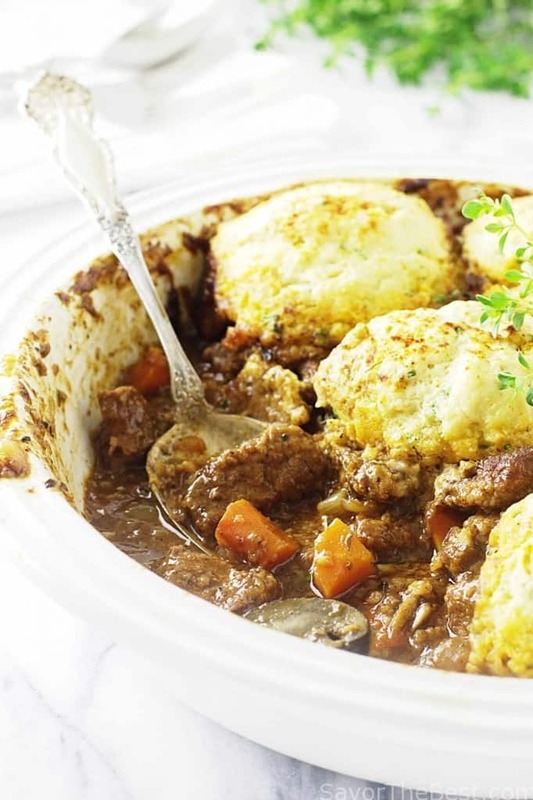 This beef casserole with dumplings is a great one-meal dinner choice. Combine the flour, salt and pepper to a large bowl and add the beef cubes, tossing to coat them thoroughly. In a skillet set over medium-high heat, add the oil and when it is hot cook the beef, in batches, removing them to a plate as they become brown. Add the butter to the skillet and when it has melted add the onion, cooking until it becomes soft, stir in the garlic and cook another 30 seconds, until fragrant. Add the wine, to deglaze the skillet scraping the bottom, cook for 1-2 minutes to burn off the alcohol. Transfer skillet contents to an oven-proof casserole dish and add the beef broth, salt, pepper, paprika and the tomato paste, stirring to combine. Stir in the reserved beef cubes. Cover with lid or foil and place in the oven and cook for 45 minutes, until the beef is tender. Remove from the oven and stir in the parsnips, carrots, mushrooms, thyme leaves and rosemary. Cover the dish and transfer back to the oven and cook for an additional 30 minutes, until the vegetables are tender but still firm. Whisk together the flour, baking powder, baking soda, salt and pepper in a medium-size bowl. With a fork, stir in the garlic and chives. Make a well in the flour mixture and add the melted butter and buttermilk. Using a spatula, fold the mixture together, scrapping the bottom and sides to thoroughly combine. The dough will be soft and sticky. Let the dough sit for 10-15 minutes to absorb the gluten and it will firm up. Remove the beef casserole from the oven. Scoop rounded tablespoon of the dough mixture and place on top of the beef mixture, spacing about 1-inch apart. Sprinkle the dumpling with the smokey paprika. Bake uncovered for 25 minutes or until the dumplings are cooked and nicely browned. 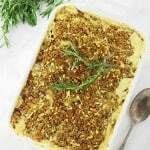 Alternative to using a casserole dish this casserole can also be prepared in a skillet and go directly from the stove top to the oven with either a lid or foil to cover.The fresh herbs can be substituted with your preferred choice. What a gorgeous stew! Love dumplings, and they make such a great top layer for the stew. And you’re right — this is a pretty simple dish. Perfect! Thanks so much. I’m drooling this looks SO good! Beautiful photography! Lovely recipe – I do enjoy baking with classic and heritage grains. We add einkorn to our sourdough. I love baking with einkorn flour. Must try making these dumplings! Perfect comfort food. I could eat every single one of those dumplings. Christi, they really are good! I made them for breakfast baked on a sheet pan. Delicious! Oooh those dumplings sound out of this world. So good!